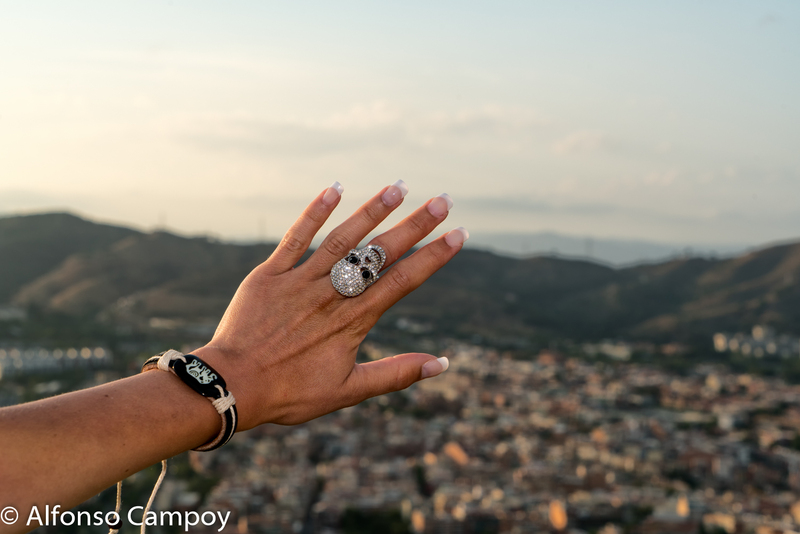 today I'm back with the last shoot realized in Spain, in a wonderful location I suggest to visit, especially at sunset...is really suggestive & romantic, moreover you could enjoy the view of all Barcelona. It's a bit exciting for me looking at these pics and remembering nice moments...As I said other times I think a lot about this city and the time I spent there....Sometimes it seems to be there again, like no time is passed. It's weird but many times I remind some moments about my life there, in the flat where I lived, the places I was used to go and people I got involved. I'm scared about my future, I've no idea how'll be (where I'll be and what I'll do), but, during the long introspection I did and I'm still doing, I realized everything has a reason and maybe I wasn't prepared for building my future in Barcelona when I moved, in 2014....Maybe was not the right time and that time will come next year or later on....or maybe was just a way station for starting to become the person I'll be....Now I want to focus only on the present, enjoying this new quiet and family life and then let's see. What do you think about? Do you regret something? Have you ever been troubled about some choices you took or are you waiting for something that sounds impossible or really hard to reach? oggi vi presento l'ultimo servizio fotografico realizzato in Spagna, in un posto meraviglioso che vi consiglio di visitare, specialmente al tramonto....è davvero suggestivo e romantico e in più potrete godere di una vista panoramica su tutta Barcellona. Mi emoziona un po' rivedere queste immagini e far riaffiorare i ricordi....Come ho scritto altre volte penso spesso a questa città e al tempo vissuto lì...A volte mi sembra che il tempo non si sia mai fermato e ho la sensazione di viverci ancora. Ricordo certi attimi della mia vita passata, l'appartamento in cui vivevo, i posti che frequentavo e le persone cui ero affezionata. Il futuro mi spaventa, non ho idea di come sarà (dove sarò e cosa farò), ma. durante la lunga analisi che ho intrapreso con me stessa, ho capito che ogni cosa ha un suo perchè e forse non ero pronta per costruire il mio futuro a Barcellona quando, nel 2014, mi trasferii...Forse non era il momento giusto e quel momento arriverà tra un anno o più avanti...o forse era solo un luogo e una tappa di passaggio per iniziare a diventare la persona che un domani sarò...Per ora voglio concentrarmi sul presente, approfittando di questa nuova vita familiare e sul domani lasciamo ancora un bel punto interrogativo. Voi cosa ne pensate? Rimpiangete qualcosa? Siete mai state tormentate riguardo ad alcune scelte prese in passato o riguardo a un qualcosa che state aspettando ma sembra impossibile o alquanto difficile da raggiungere? Muchas gracias Paty!! !Tienes razon...no puede ser todo bueno y positivo...y tambien lo negativo sirve, a madurar y crecer... espero llegue pronto mi momento y que en futuro encuentre una serenidad y estabilidad! You look beautiful as always Sophia! I love your outfit, and the images and skyline. It's lovely to revisit places from the past, and usually leads to reflection. I can certainly relate to what you said, about the uncertainty of the future. This troubles me greatly as well, and in general I tend to overthink my past actions a lot. However, timing is everything, and the skills you're acquiring now, through blogging and also your life experiences, have a real value. Thanks Saba!! !I always read with pleasure your comments....I've the same problem of you...I overthink about everything (life, love, job....) and sometimes I envy people who are able to let things roll of their back...helps to live better, without pressure and concern....Anyway I think that the best thing is to be in the right place & in the right time...that's everything...I'ma waiting for this opportunity...in the meantime I focus on the present trying to do something useful also for the future!!! This location is so stunning and I love the energy you have in front of the camera! Adoro il body e fantastica la location! Loved the pictures, you look so beautiful! I loved the top and the sandals, the skull ring is also awesome! You are so right, sometimes we are not prepared for some things... and sometimes we get prepared at the very time we arrive. I also remember places, people, situations... if I regret something, you asked us... I think that if I didn't do this and that, I would have this and that experience, but I must confess that I do regret some things :) Hope you have a very nice day! Thanks Denise for this lovely comment....I'm thinking about my past choices and about my future since a lot and just now I realized I can't change that I did, I've just to don't repeat the same mistakes and maybe what I'm waiting for will come later...It's said that things come when you least expect it!!! Absolutely beautiful look. New to you and your blog. LOVE your style, and can't wait to see more. Thank you so much Andreea!! !Have a nice day you too!!! Thanks Tatjana!! !Have a nice weekend you too!!! Thanks Harija, you're so nice!! !I'm glad you like the post!!! Wow, wonderful pictures the view is amazing and you look gorgeous. You have a great blog, would you like to follow each other? Thanks, too nice...that place is simply amazing!!!! La Spagna è splendida, tutta! Thanks Floortje!! !Have a nice day! love the pics, u r such a stunner! Thanks Enik, have a nice day!!! Bellissimi scatti Sophia, hai ragione questo panorama è uno spettacolo! Thanks Tania, I'm so glad you like it!!! Wowww hai un fisico pazzesco. Grazie mille Maggie^^ troppo gentile!!! Wow, look at you sitting on the edge. I'd be scared a little lol. Thanks Funmi...jejeje...I'm a bit "crazy" so I'm attracted to these places!!! Precioso look para una fotos fantásticas. Besos. Pues estaba de vacaciones y en una ciudad que me gusta mucho....no podia ser mas radiante jejeje!! !